This original Kudos Kitchen recipe for Speedy Keto Chicken Parmesan Stuffed Portobello Mushrooms is my fast and speedy riff on a traditional chicken Parmesan…with a twist! I’ve said it before, and I’ll say it again…sometimes my best recipe ideas come from wandering aimlessly around the grocery store with nothing specific in mind. Until, WHAM! 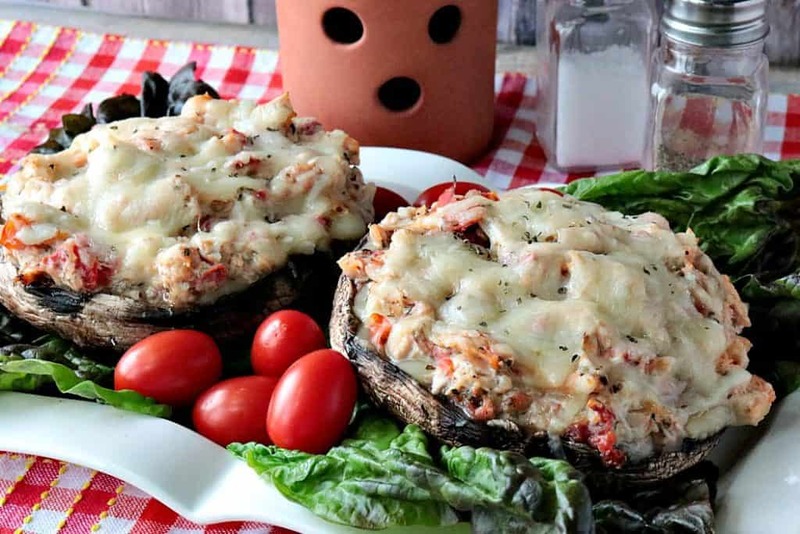 And so it is with this recipe for Speedy Keto Chicken Parmesan Stuffed Portobello Mushrooms. WHAM! If you love mushrooms and are eating a keto diet plan (or even if you’re not), you’re going to love this easy, speedy dish! 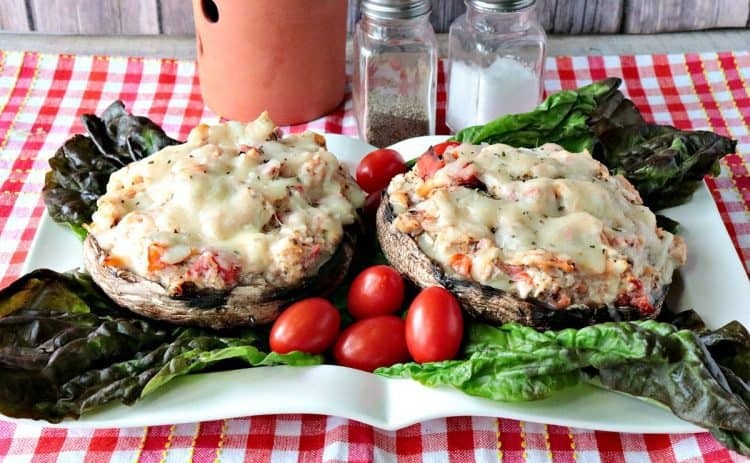 Since this recipe is for SPEEDY Keto Chicken Parmesan Stuffed Portobello Mushrooms, I’ve used store-bought rotisserie chicken so dinner will be on the table in less than 30 minutes! YAY! 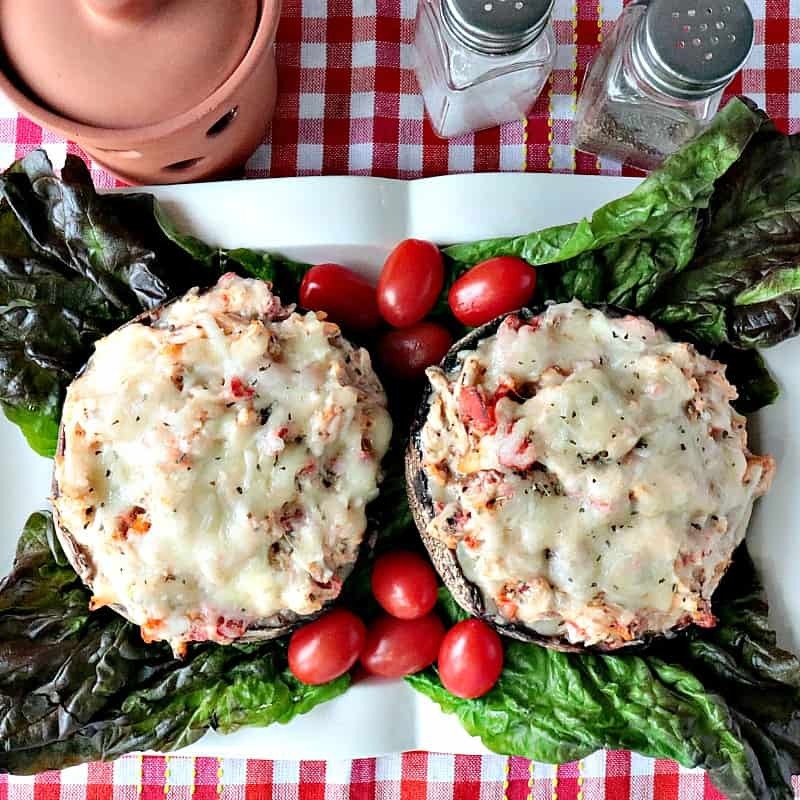 **Please Note – The printable recipe card with detailed instructions and complete ingredient measurements for making Speedy Keto Chicken Parmesan stuffed Portobello Mushrooms is available near the end of this post. Remove and shred approximately 2 cups of chicken from the rotisserie chicken (reserve the remaining chicken for another use) and place in a medium bowl. Add the drained can of fire roasted tomatoes to the chicken. Add the basil, oregano, garlic, shredded Parmesan, cream cheese, salt, and pepper to the chicken. Stir well to combine. Use a spoon to gently clean out the gills and stem from the portabello mushrooms. Add two slices of provolone cheese to each mushroom and top each with 1/3 of the chicken mixture. 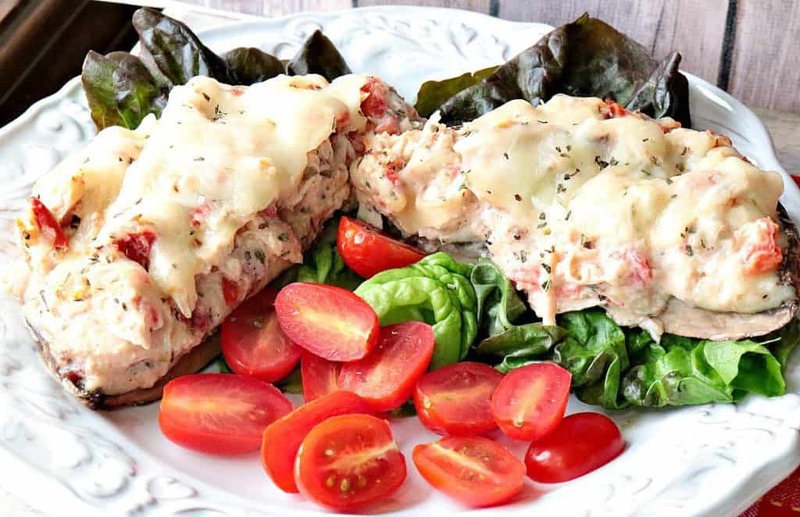 Top each with shredded mozzarella cheese and bake in a preheated 350-degree oven for 20-25 minutes. Below is the printable recipe card for today’s Speedy Keto Chicken Parmesan Stuffed Portobello Mushrooms. 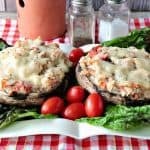 Even if you're not eating a keto diet, this Kudos Kitchen original recipe for Speedy Chicken Parmesan Stuffed Portobello Mushrooms a fast and speedy riff on a traditional Chicken Parmesan...with a twist. You're going to love it! In a large bowl, stir together the chicken, drained tomatoes, basil, oregano, garlic, Parmesan cheese, cream cheese, salt, and pepper. Place the cleaned mushrooms onto a baking sheet. Place two slices of provolone in the bottom of each cleaned mushroom. Divide the chicken mixture into thirds and mound each mushroom cap with 1/3 of the chicken mixture. Top each chicken Parmesan mushroom with the shredded mozzarella cheese. Bake the chicken parmesan stuffed portobello mushrooms for 20 minutes, or until the cheese is perfectly melted and the chicken mixture is heated through. **Note - Do not season the mushrooms before cooking. The salt will draw out the moisture in the mushrooms and make them soggy and watery. **Note - Make sure to clean the outside of each mushroom cap with a damp paper towel. baking sheet, medium bowl, measuring spoons, wooden spoon, spoon for cleaning the mushrooms, paper towels, measuring cups. 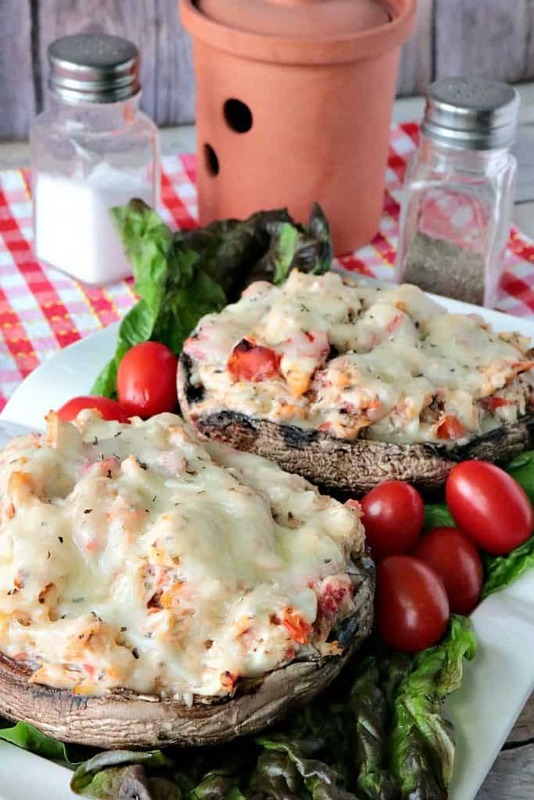 Even though I came up with this recipe for Speedy Chicken Parmesan Stuffed Portobello Mushrooms because we’ve been trying hard to follow the keto eating plan here are our house, this recipe is by no means strictly for keto eaters. It is for anyone who loves good food, especially those of you who love good food that can be made in a hurry! 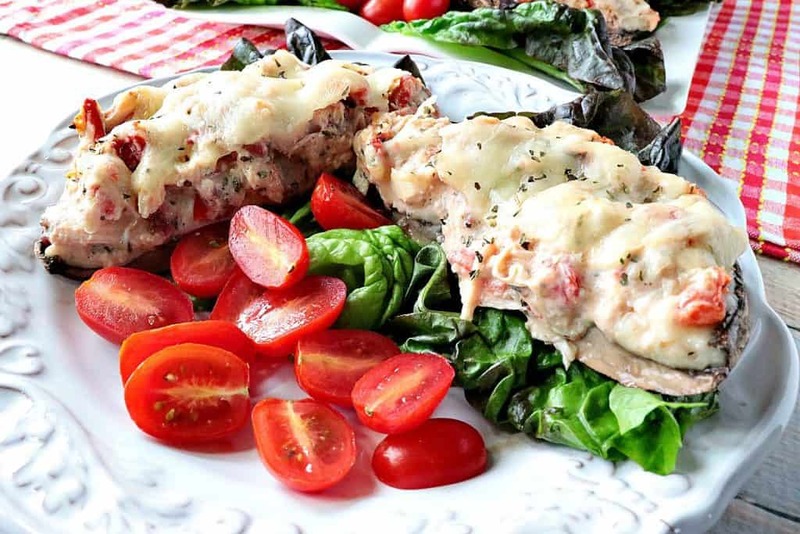 I sincerely hope you’ve enjoyed this recipe for Speedy Keto Chicken Parmesan Stuffed Portabello Mushrooms as much as I’ve enjoyed bringing it to you! Should you have any questions regarding this recipe, or anything else you’ve seen on my site, please don’t hesitate to contact me directly, or leave me a comment in the comment section below. It is always my distinct pleasure to get back to you with a reply just as soon as I possibly can! Is this the ultimate weeknight comfort food dinner or what?! LOVE these chicken parm portobellos! Thanks. They’re so fast and delicious! I agree about them being comfort food. What a great recipe to use rotisserie chicken in. Thanks for the tip on not seasoning the mushrooms before cooking. I hate when they get watery!